Ali Qadir and Tatiana Tiaynen-Qadir offer an initial description of the widespread presence of uncanny images in religious practice in South Asian Islam and Russian Orthodox Christianity. Drawing on their multi-sited fieldwork, the authors map the presence of two religious images in each tradition that are familiar yet eerie, and that signal a rupture from the ‘normal’ order of things. Their analysis proposes that uncanny images make a phenomenological demand of the viewer that inherently challenges literalist or allegorical readings. While literalist readings increasingly attempt to tie down singular meanings of such images (or ban them altogether as in many Islamic cases), in practice many faithful viewers assign differing meanings to them as part of their locale, era, and life condition. The persistent use of such inexplicable images in vernacular religious practice opens the path for further empirical mapping and theoretical analysis into our collective religious unconscious. Image 1: Painting of Christ with breasts, Hospices Lessines, Belgium. Image credit. Since the seminal paper by Leonard Primiano there has been much development of the concept of ‘vernacular religion’, or religion as it is lived (Primiano 1995). Mappings of vernacular practices of religion have revealed hitherto ignored insights into how people live their faith in a range of settings, from participating in pagan rituals in Britain to pilgrimages in Spain to following supernatural phenomena in Estonia (e.g. Bowman and Valk 2012). Rooted in folkloristic studies, the concept cuts across older binaries of ‘official’ vs. ‘informal’ religion, underscoring how all religion is a matter of embodied practice. It focuses, thus, on ‘the experiential component of people’s religious lives’. However, the powerful idea of vernacular religion has rarely been applied to theorization of materiality in religious practice. In particular, there has been little attention to material images, not just how people relate to the idea of a picture or image, but how people live their religious lives in relation to actual, physical paintings and the like. Our recent work has been exploring precisely this nexus of how people relate to material images in their religious practices. In our fieldwork among Orthodox Christians and Muslims in a range of settings, we have come across a remarkable phenomenon: the presence and use in religious practice of images that can only be described as ‘uncanny’, or mysterious but oddly familiar. Such images tend to resist any singular interpretation or meaning. Their disproportionate or entirely unreal nature—as in Image 1 above—is disquieting and disturbs the modern order of things. Yet they are oddly resonant and familiar to faithful across cultures, and are widely ‘used’ in religious practices. What do these images do in religious practice? How should we make sense of physical paintings and depictions that do not themselves make any literal sense? What does it tell us that uncanniness is to be found in so many religious images across traditions? In this blog post we focus on one such image each in Orthodox Christian practice in Russia and in Indo-Persian Islam. There is no unavoidable reason why we focus on these, except that we draw on our own long-term, ethnographic engagement in the two communities. In ongoing research we draw also on related images, their histories, and examples of their uses in these traditions. By ‘tradition’ we do not mean some archaic beliefs and outmoded practices. Rather, we use it in the sense of living traditions, involving perpetual handing-on of teachings, practices, mores, truths, and so on. A tradition’s contemporaneity is what makes it relevant, and its sense of its own historicity is what makes it ‘traditional’ (Gadamer 1987). Far from being ossified, traditions are living, pulsing domains and, as such, are highly contested. Virtually every instance of ‘tradition’ that we discuss here may be hotly contested by other interpretations. Consider, for instance, the common perception today that Islam (especially Sunni Islam) is aniconistic and, in particular, prohibits depicting the figure of the Prophet Muhammad. Yet, our research into Islamic images show that this is far from true across the board, and is even less so as we go back in time to what are often considered more ‘pure’ times of Islamic history. Primiano suggests that vernacular religion is necessarily the product and process of various influences and factors. Criticising the binary and unproductive division between ‘official’ and ‘everyday’ religion, Primiano underlines vernacularity also in institutional and theological elements of religiosity. Even the Pope in Rome and the Patriarch in Constantinople practice their religion vernacularly: there is always some ‘passive accommodation’ and ‘active creation’, some reflection on lived experience that influences how these individuals direct their religious lives (Primiano 1995, p. 46). The point is that common ways of thinking about religion in the abstract, which is then turned into practice, is mistaken. Rather, more often religion is lived in praxis and dogma follows. The emphasis on ‘human artistry … the experiential component of people’s religious lives’, spotlights the importance of creativity and artistry expressed by the human drive to interpret religious experience. The focus on art leads us into how vernacular religion materializes (Bowman and Valk 2012; Houtman and Meyer 2012). Materiality is the felt-life of a religion, and begins with an assumption that religion is grounded in the body as the matrix of human experience (Morgan 2005). Religion is experienced mentally, bodily, emotionally and practically, and people make sense of the experience holistically, in an ‘embodied and embedded praxis’ of ‘religious aesthetics’ (Meyer and Verrips 2008). Religious aesthetics is not purely a matter of mental belief, but involves feeling, emotion, sensation, and perception. Faculties of imagination, intuition and discernment are more important than conceptual thinking (Morgan 2005). This perspective draws attention to the fact that many believers approach material objects, including images, as mediums that facilitate encounters with the divine and bringing immediacy (Meyer 2011). But, what about uncanny images? Images that show the human body disproportionately, or in unsettling ways are more common than we might assume, and especially so in religious practices. There is a long history of thought about the uncanny, but much recent work builds from Freud. For Freud, in his 1919 essay on The Uncanny, the term related to an ‘estrangement in the home’, something new and unsettling in what is otherwise well-known and settled (Freud 2003). The uncanny is as important for what it hides/ conceals as for what it shows/ reveals, and it is this tension that produces a cognitive dissonance. In the terminology of Freud’s once-protégé and later arch-rival, depth psychologist Carl Jung, the uncanny is a symbol in the true sense of the word: it cannot be fully captured or literalised, yet it can be still widely used. For Jung, a symbol’s meaning can never be affixed, yet it is crucial to our lives since symbols say what cannot be expressed in any other way. A symbol, crucially, is not simply a sign or replacement for saying something differently, like an allegory or simile: it is a fundamental challenge to the literal that resists singular interpretation. The uncanny, in this sense, is an uber-symbol. In our research, we have come across a variety of such uncanny images that faithful employ in their religious practice. We discuss here two such: an icon of the Virgin in Russia depicting her with three hands, and a painting showing the Islamic Prophet Muhammad with two left hands. Our purpose is not to affix a single reading on an image, but to show how these have been absorbed into vernacular religious tradition. Icons depicting Jesus, the Virgin, or saints occupy a central role in the practice of Russian Orthodoxy, and there are literally hundreds of miraculously revealed icons that people make pilgrimages to see in person. Copies of icons, mostly painted (or ‘written’) by hand, are not only central to Orthodox churches but also occupy prime places in home altars. People often buy and pray through a particular icon because of a ‘connection’ they feel to it. It was in such a setting that we came across the icon of the three-handed Virgin Mary (who is referred to as the Mother of God). Iconography of the three-handed Mother of God originates in early eighth-century Syria during the struggle for defence of icons (Tradigo 2006, p. 219). According to tradition, John of Damascus (a key theologian of icons) was unjustly accused and imprisoned, and had his right hand cut off. He spent the night in prayer, had a vision of the Virgin, and woke up healed. Moved by his vision and the miraculous cure, John of Damascus hung a silver hand upon the icon of the Mother of God. This icon became especially venerated in the Serbian Orthodox church, and up till now remains the main treasure of the Serbian Orthodox Monastery of Hilandar on Mount Athos in Greece. During some periods, this icon virtually acted as the abbot in the monastery. Over time, two variations of the Three-handed Mary became canonical: one that depicts a silver hand alongside the Virgin, and another that depicts it hung around the neck of the Mother of God. In both cases, the third hand clearly represents John’s hand and reminds the viewer of the miraculous healing. Image 2: Troeruchitsa icon in the Serbian Orthodox Monastery of Hilandar, Mount Athos, Greece. Image credit. Yet, iconography of the three-handed Virgin underwent an amazing transformation in Tsarist Russia, when icon-writers (ikonopistsy) started depicting the third hand as belonging to Mary herself! The miraculously healed hand of John of Damascus became a third hand of the Virgin. Growing popularity and vernacular use of icons depicting the three-handed Virgin (Troeruchitsa in Russian) became surrounded by folklore tales. Today while many Russian Orthodox believers would refer to the legend of the miraculous healing of John Damascus, some will also turn to those tales in their practices and understandings. According to these stories, the icon commemorates the episode from Mary’s life, when she had to cross a river while escaping, the third hand was given to her by God in assistance. There are variations in which the Virgin crossed the river with one child (Jesus), or even with two children, some in which she was fleeing to Egypt with her Child and others when she was fleeing robbers (Belova 2015). Some of our interlocutors mentioned that they in fact had not noticed the third hand of Mary for many years, even when a copy of the icon was in their homes or in a nearby church. The three hands are depicted so naturally that it may go unnoticed for many years of engagement with the icon. Even church poetry, used in liturgical practice in Russia, incorporated the vernacular vision of Mary as having three hands. The troparion in Church Slavonic, available on the Russian Orthodox website (http://azbyka.ru/days/ikona-troeruchica [last accessed on 4 August 2016]), glorifies the three hands of the Mother of God that ‘emerge in the image of the Holy Trinity’, in which two hands hold Christ, and the third one ‘delivers’ from pain and troubles those to turn to the Mother of God. This poetry speaks of Mary with three hands naturally; Mary emerges both as the eternal Mother who holds her divine Son in her two hands, and at the same time the Helper to those in need with her invincible powers that the third hand embeds. People pray in front of this icon, asking for health, especially in cases of injuries to hands and legs as well as mental disorders. This Russian iconography of Mary with three hands is also well known in Orthodox communities worldwide, for instance in the Finnish Orthodox Church. Icons of the three-handed Mother of God are given as baptism presents or when joining the church, and are also popular amongst Finnish intellectuals and artists. Historical trajectories surrounding the icon of the three-handed Mary illustrate that Orthodox Christianity has provided substantial space for vernacular practices around this uncanny image, and the ROC has mainly incorporated this vernacular vision in its church practice, manifested in both iconography and church poetry. Yet there have been voices within official Orthodoxy that have been resisting this vernacular vision of Mary with three hands. For instance, many priests recognize only rationalized explanations, insisting that the third hand ‘merely’ signifies John’s hand. The official site of the Orthodox Church in America is firm on this allegorical reading, ascribing the third hand of Mary in the iconography to a ‘mistake’ or ‘ignorance’ of iconographers and insisting on the use of scare quotes to set apart the ‘three hands’ from normal ideas of the human body (OCA). Similar ‘explanations’ exist for other Orthodox icons, such as those portraying St. Christopher with donkey’s or a dog’s head (Image 4), an icon that we found in a private collection in Finland. Rationalists insist that this is due to a mis-spelling of the Saint’s name in Latin (originally Cananeus, referencing his ethnicity background in Canaan, to Canineus, meaning dog) by the person translating into Greek. Even the Russian Orthodox Church has banned this image since the 18th century for being against ‘natural history’. Yet, that has not stopped at centuries of icon writing around the world continuing with the uncanny depiction that defies any single interpretation. Image 4: Icon of St. Christopher, Byzantine Museum of Athens (originally from Asia Minor, 17th century). Image credit. The history of Islam, too, reveals such tensions, although the dynamic has been different. In contrast to the common assumption about Islamic aniconism, it is important to emphasise that sacred images used to be common in the Muslim world, including depictions of the Prophet Muhammad. The iconographic style of these images (similar in many respects to Orthodox icons) indicates that the images were not meant to be taken literally as precise representations. Consider this medieval painting of unknown origin that depicts the flight of the Prophet from Mecca to Medina with his Companion Abu Bakr in AD 622, being chased by the Quraysh. A closer look at the painting (Image 5a) reveals that the Prophet has two left hands – another eerie image. This image contests not only literalism of not depicting the Prophet, but also categorical advice by many modern Muslims to ‘use the right hand for noble matters, and the left hand for lowly matters’. Arguably, this image points to the importance of the state of receiving revelation, which lies within the domain of senses and intuition. Image 5: Charge of the Lion, painting of unknown provenance, Bibliotheque Nationale, Paris. The nature of contemporary Muslim practices around images varies from place to place. In West Africa, for instance, devotees frame and touch paintings and photographs of Sufi saints and their descendants to receive Baraka (blessing, Divine Grace) (De Jong 2016). Traditionally in Indo-Persian Islam (as in the case of Image 6 below) such illustrations were common in religious treatises dealing with spiritual enlightenment or providing instructions on religious life. In South Asia, vernacular expression takes, for instance, the form of ‘truck art’, (Image 7) in which Buraq – the mythical steed that carried the Prophet Muhammad on his spiritual Night journey (Miraj) – is still a common image (Ahmed 2011, p. 6). Increasing pressure of modern religious literalism (often conveyed by authorities today) on vernacular religiosity is evident in the fact that depictions today tend to omit the Prophet or blank out his face. Image 6: Muhammad et ange en forme de coq, Illustration in book Me’răj nămeh by Farid-ud-din Attar (AD 1436), Bibliotheque National de Paris, Record# RC-C-02688. Image 7: Truck art in Pakistan with the image of Buraq. Image credit. The medieval illustration depicts an episode from the Prophet’s Night journey, when he ascends to Heaven and speaks to God, who instructs him regarding the prayers, and when he meets older Prophets. On the way he meets, of all creatures, the Heavenly Rooster with feet planted on the earth and crown brushing the heavens. In Islamic practice today there is hardly any space for images of the Prophet due to the dominance of religious literalism, an irrevocable condition of modernity. Nevertheless, arguably even the aniconistic art of calligraphy, mosaic and ornament can be seen as ‘visual representation of God’ in Islam, representing divine presence in the world (Elias 2011, p. 127). Similarly, the popularity of Buraq, depicted on trucks for safe journeys, illustrates the appeal of material images in vernacular use. A winged creature, something in-between a mule and a horse with a woman’s head and often a peacock’s tail, is both eerie and surprisingly familiar. Buraq, too, cannot be reduced to any singular interpretation or reading, but belongs to another domain of the disturbing yet comforting, self-evident yet elusive. We have addressed only a few of the uncanny images that we find in our fieldwork among Orthodox Christians and Muslims. Common to all of them is the feature that they resist any single, allegorical reading: each of them stands by itself, with no one literal explanation and a multitude of ‘stories’ surrounding their use in religious practice. Showing bodies disproportionately or differently from common biology, they provide a disjuncture in the normal order of things. What we find is that faithful make up meanings for themselves, or adopt them as part of tradition, according to their era, and even life situation. As in the case of Troeruchitsa, these interpretations may well change over time and locale. We analyse this as images—especially uncanny ones—making a phenomenological demand of the faithful that inherently reaches beyond the loci of literalist readings. Rather, meanings are to be found in the vernacular practice of the faithful, and just as those practices are tied to time and place of traditions so are the meanings. This cuts across the divide between ‘official’ and ‘everyday’ religion, since any interpretation (for instance an icon-writing style) can be taken over into official dogma by some yet be rejected by others, as in the case of St. Christopher. As in the case of all traditions, contests abound around the interpretation or ‘appropriate’ use of religious imagery. One strand of contest has universally come from the desire—or, perhaps, impulse—to find a rational, literal explanation for uncanniness that reconciles with the state of sanctioned scientific knowledge of the time. Such is the nature of modernity in connection with religion, what Jung’s famous student and depth psychologist James Hillman called a ‘Cartesianist’ outlook. In Cartesianism, literalism is:an idol that forgets it is an image and believes itself a God, taking itself metaphysically, seriously, damned to fulfill its task of coagulating the many into singleness of meaning which we call facts, data, problems, realities … Remember: the enemy is the literal, and the literal is not the concrete flesh but negligence of the vision that concrete flesh is a magnificent citadel of metaphors (Hillman 1975, pp. 150, 74). We venture to suggest that such an impulse has always been present: in this sense, if in no other, we have always been modern. This impulse is far more common in Islam than in Orthodox Christianity (Ahmed 2010), as evident in the almost complete ban on iconic depictions defended violently by ordinary Muslims almost across the world now. It should be said, following Hillman, that there is nothing inherently ‘wrong’ or ‘incorrect’ about a reductionist or rationalised explanation of, say, an image. This is one way, and a valid one, of describing reality. However, our era of modernity is marked by the exclusivism of literalism, in which no ‘Other’, no alternative interpretation, is sanctioned, which is more and more the case with Islam. Yet, uncanny images persist in Islamic and Orthodox traditions. Despite all literalist readings or rationalised critiques, faithful continue to have and use these images in different ways. Indeed, a dual effect of modernity is that, on the one hand literalist critiques deprive the uncanny of its uncanniness, while on the other hand technology offers the means to circulate those same images around the world at the click of a mouse. It is the very fact of this circulation that reveals the phenomenological significance of uncanny images. In our current research we understand this tremendous spread and use in a post-Jungian framework of the ‘collective unconscious’, that part of each person’s unconscious that is shared across all of humanity (Jung, Collected Works Volume 7, §437ff). ‘Tradition’ gains significance in this framework as reflecting and extending humankind’s collective unconscious. Virtually ipso facto, tradition has been the enemy of literalism. It remains to be seen what happens to uncanny images as our modern tradition evolves. Ahmed, D.S. 2010. Penetrations: A Psychocultural View of Modernity, Fundamentalisms and Islam. In Islam and Europe: Crises are Challenges, eds. Carlier, J-Y and Foblet, MC, 53-69. Leuven: Leuven University Press. Ahmed, D.S. 2011. The Journey: Buraq, Jhuley Lal and Zulljinah. In Mazaar Bazaar: Design and Visual Culture in Pakistan, ed. Zaidi, S, 2–9. Karachi: Oxford University Press. Belova, O. 2015. Иконография святых и рассказы о них: Богородица „Троеручица”(принципы взаимодействия образа и текста). Проблеми на изкуството, no 2: 50-53. Bowman, M. and Ü. Valk. 2012. Introduction: Vernacular religion, generic expressions and the true dynmic of belief. In Vernacular Religion in Everyday Life: Expressions of Belief, eds Bowman, M and Valk, Ü, 1–19. London: Routledge. De Jong, F. 2016. Animating the archive: The trial and testimony of a Sufi saint. Socal Anthropology 24, no 1: 36–51. Elias, J.J. 2011. Not reading the writing on the wall: The purpose of Qur’anic Calligraphy on Buildings. In Mazaar Bazaar: Design and Visual Culture in Pakistan, ed. Zaidi, S, 120–29. Karachi: Oxford University Press. Gadamer, H.-G. 1987. The problem of historical consciousness. In Interpretive Social Science: A Second Look, eds Rabinow, P and Sullivan, WM, 82-140. Berkeley: University of California Press. (Orig. pub. Graduate Faculty Philosophy Journal (Fall 1975) 5(1): 8-52). Hillman, J. 1975. Re-visioning Psychology. New York: Harper & Row. Houtman, D. and B. Meyer eds. 2012. Things: Religion and the Question of Materiality. Bronx, NY: Fordham University Press. Meyer, B. 2011. Mediation and immediacy: Sensational forms, semiotic ideologies and the question of the medium. Socal Anthropology 19, no 1: 23–39. Meyer, B. and J. Verrips. 2008. Aesthetics. In Key Words in Religion, Media and Culture, ed. Morgan, D, 20–30. London: Routledge. Morgan, D. 2005. Sacred Gaze: Religious Visual Culture in Theory and Practice. Berkeley: University of California Press. Oca. 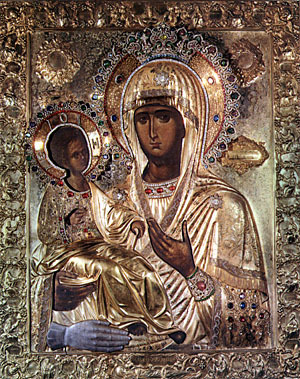 Icon of the Mother of God of “the Three Hands”. https://oca.org/saints/lives/2015/06/28/101839-icon-of-the-mother-of-god-of-the-three-hands, last accessed 2 Sept. 2016. Primiano, L.N. 1995. Vernacular religion and the search for method in religious folklife. Western Folklore 54, no 1: 37–56. Tradigo, A. 2006. Icons and saints of the Eastern Orthodox Church. Getty Publications.